Faster than figurines, tougher than cardboard, and way more fun to make. Even in an age of immersive video games, there are those who like to play tabletop games. Real-world wargaming is very different from playing a multiplayer online game, even with real-time voice chat. Whereas Eve Online or Xbox Live is kind of like hanging out with your buds watching TV, actually getting together and playing a board game is more like a real party. Manipulating the physical game pieces is also satisfying in a way that virtual objects have yet to achieve. Many tabletop gamers eventually end up making their own pieces, for one reason or another. They may be making a custom army for an established game, or they may be inventing a game from scratch. The time-honored method is to use illustrated cardboard “chits” that lie flat on the table or stand upright in simple bases. For pieces fully “in the round,” you can buy commercial 3D figures and customize them to your taste. If you have the time, you can sculpt your own minis and (these days) even 3D-print them. Shrink film makes a nice intermediate approach to original mini design, midway between cheap cardboard cutouts and fully dimensional figurines. Shrink plastic is much more durable than cardboard and, unlike traditional minis, you can make your artistic mistakes at the software level, where they’re easily fixed. Feel like giving it a shot? Read on. 5. Finish the edges (optional). Step #1: Design your minis. Check the directions to figure out how much your film is going to shrink. The film we used shrinks by about 50%, meaning that the designs as printed need to be about twice as big, in each dimension, as the desired miniature size. If you want to make your minis stand upright by adding bases, be sure to leave an empty “tab” at the bottom of each image so they can be attached without covering the art. Medium-size binder clips, for instance, have a footprint of about 1.25"×3/4" which, accounting for 50% shrink, will cover a 2.5"×1.5" “tab” at the bottom of each image. 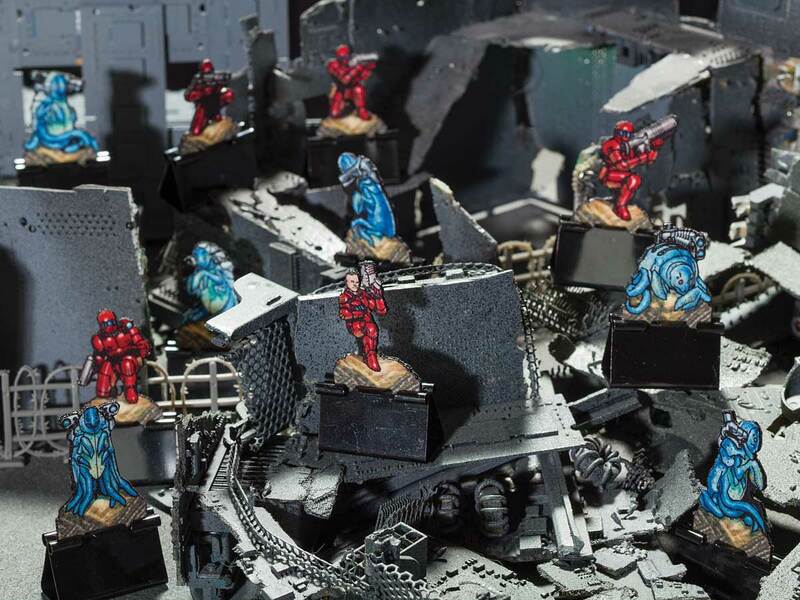 If you don’t want to design your own minis, or just want to experiment with the method, we've put together two opposing sets of squad-level markers for Ground Zero Games' fantastic open-source sci-fi wargame Stargrunt II. Download the ready-to-print artwork for the Earthicans and Squidites. Step #2: Print 'em out. Shrinking causes the color saturation of your images to increase, so they will need to be lightened before printing to keep them from ending up too dark. You can use the color settings dialog on some printers for this, or a dedicated image-editing program like GIMP or Photoshop. We've had best results from turning the brightness up about 50% before printing, but you may want to experiment before printing a large batch. Step #3: Cut 'em out. You can make the profiles as complex as you like, but keep in mind you may have to cut out a lot of them, so you may want to avoid a lot of intricate edge detail and internal openings. Square or rectangular is naturally easiest. Casualty and other "flat" counters can be designed this way, and cut out quickly in bulk using a swing-arm paper cutter. Refer to the directions on your film for shrink times and temperatures. Ours took about 10 minutes per batch, in an oven preheated to 300°F. Watch the pieces as they shrink. They will curl up, then re-flatten — sometimes not completely. If that happens, compress them gently with the back of a spatula while they're still hot. Let them cool before handling. Step #5: Finish the edges (optional). I find a black edge looks better than a bare one. A paint pen works better than a Sharpie. Step #6: Add bases (optional). Bases for shrink film minis (or any flat game mini) can be improvised readily from small binder clips. The photo sequence illustrates the process. Clamp the clip to the base of the piece as shown. Remove the wire handles from both sides of the clip by compressing them. The black spring remains in place on the mini, forming a functional, discreet, good-looking base. If your printer can align duplex printouts closely, it may be possible to print mirror images on either side of the film and make double-sided minis. You could put the same design on each side, for looks, or put an “injured” or “battle-damaged” unit on the back.